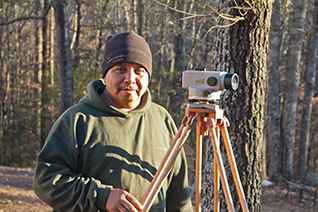 Felix Romero, an installation crew leader, began his employment with us in 2010. He brought with him ten years of landscape industry experience. Now a veteran, his expertise, professionalism and communication skills make him an effective leader. Felix’s passion for his work is kindled by learning new skills. Our company’s creative design approach often involves incorporating unusual design elements and always, unusual and interesting plant material. This provides Felix with a great opportunity to grow his passion- horticulture. With a work history that enables him to compare, Felix sees that at the Fockele Garden Company he has opportunities to learn a wide array of skills, from irrigation system installation to patio construction. Working in both commercial and residential settings, Felix applies The Fockele Garden Company standards of excellence to produce wonderful gardens. Felix lives in Gainesville with his wife, a son, three daughters and a grandson. Grandparents are regular visitors, travelling to visit from their home in Mexico. Felix loves to employ his landscape and construction skills doing home improvement projects- for his family and for his friends.